I have always liked to cook. Sunday evenings in the 50’s, I’d take the pressure off my mother and cook my “special” for the three of us—macaroni cheese topped off with grilled tomatoes. As a bachelor, instead of takeaways, I’d spend an hour or more preparing my supper–and 10 minutes eating it! For the last 20 odd years I have been the cook in the family. Though Meredith is no slouch in the kitchen, she’s been happy to let me get on with it. This daily routine has proved invaluable since being diagnosed with Type Two diabetes, twelve years ago. It has allowed me to control what I eat–but I’ve also tried to cook meals that Meredith–who does not have diabetes– can fully enjoy too. From this came the idea of a cookbook of recipes suitable for “type two-ers” and those they love. 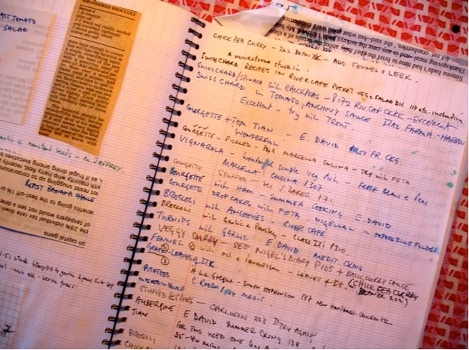 I have a large spiral notebook with an index into which I’ve pasted recipes for years — my mother had one too. Our kitchen shelves are weighed down with cookbooks–a collection kept up-to-date by family and friends. My style of cooking in usually Mediterranean—based on olive oil, tomatoes and garlic. This cuisine–with a little tweaking–suits the slightly different way of eating that I adopted once the diabetes showed up. Friends started to contact me–knowing I was a type two-er–for advice. Either they themselves had been warned by a doctor that they were pre-diabetic–or they had a friend who had been recently diagnosed. 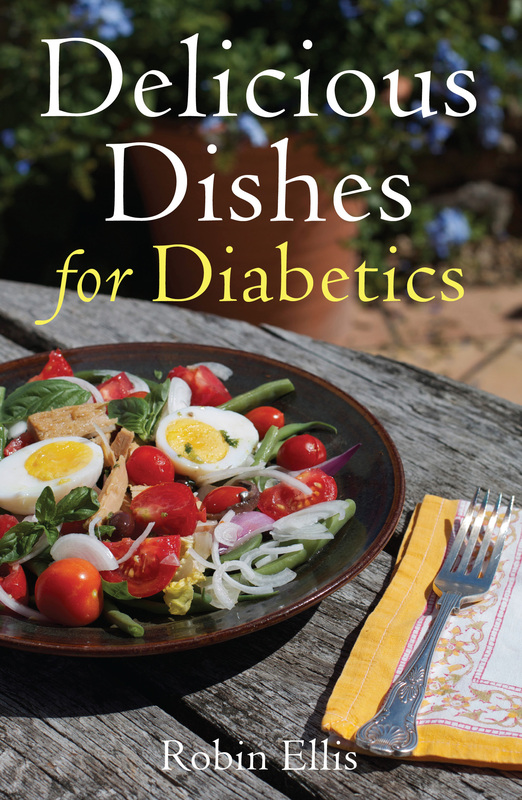 I would send a few recipes as examples of healthy dishes for diabetics–and soon had a growing file. I don’t claim to be an expert. But my own experience of changing what I ate and exercising more WORKED for me. My glucose levels returned to the normal range and I managed to avoid taking medication for many years. That collection of recipes for friends forms the basis of my first cookbook, published in the UK by Constable & Robinson in August 2011. In the United States, it comes out in November 2011 published by Skyhorse. It’s available at your local bookstore or via www.amazon.co.uk/ or www.amazon.com. Posting on a different topic here – have you tried any ancient Roman or Greek recipes? An interesting variation on what we now consider ‘Mediterranean’ cooking. At the risk of sounding like some ghastly groupie, could I ask you to sign a copy of your recipes book for me? I can post it to you from the UK and will of course pay any return postage. Alternatively, if you’d prefer not to give out your address, I could send you payment electronically, say, for the postages and for a copy of your book. I quite understand if you’d rather not do either. Of course and with pleasure, Mark. It comes out in August–so we’ll work out a way. The rabbit dish sounds good. I would use a scant tablespoon of chickpea flour to thicken the gravy a bit, better than refined flour for type twoers. I like the idea of long low heat cooking though. It’s as much as I can do to keep up with modern recipes –for now anyway! Thanks, Pat–paying attention to what you eat can be surprisingly rewarding. Robin, can’t wait to have “my” book!! I just order at my international bookseller in Florence, I will be great read it!! Hello, Robin! Have just joined as a subscriber and have also just ordered 2 copies of your book from Amazon, which will arrive tomorrow – can’t wait! My boyfriend of 16 years has just been diagnosed pre-Type II so this is a wonderful way to make sure we can still enjoy eating well and being healthy at the same time. Much envy you your Vie en France, since was raised from age 6 – 12 in Fontainebleau, and cannot live without at least a yearly visit to France as my fix! The book is a well-deserved success and will also I am sure help lots of readers. Thanks, Rosalyn for your kind words–much appreciated. Formative time to have lived in France. Yes, a complete “implantation” in a French school, the only English girl, for which I am eternally grateful! We actually lived outside in a lovely village, Fontaine le Port, and were schooled in Fontainebleau., with memorable holidays, inter-alia, to Cabourg, Deauville, Avignon, Antibes, St Raphael, etc., Planning on finally retiring in France. Your blog is a delight, and if Amazon do their stuff correctly, 2 copies of your book will arrive today. One for Bath, and one for London! This evening the chilled cucumber/yoghurt soup is on our menu (taken from the Daily Mail supplement article). Thanks Rosalyn–I love that soup! Hi Robin: I remember when I visited you & Simon in England in the late 60’s that you were a great cook. Sorry to here about the diabetes but good for you to work on it naturally. Keep up the good work… I wish you continued success. Hi Diane–I remember of course. Thanks for your good wishes and thanks for the comment. I’m writing you from Rome (Italy), just coming back from my sixth holiday with my family in England, land that I love with all my heart. In the presbyter where we were lodged, there were many videocassettes and, between them, there was “Poldark”. I put the first vhs on and it was like to take a leap into past, back in 1978 when we used to watch that wonderful saga, often in black and white – because there wasn’t a colour television in the house we used to rent during the summer – every Sunday evening with all my original family. I was 17 at that time and I was (and also my mum and granny were) completely mad for him, his old-fashioned good manners with ladies and friends, his brave and resolution with his enemies, always helpful in relieving people in trouble and… you were such a dashing, handsome boy and a really great, extraordinary actor! I remember that at the end of every episode, I used to think that I would have liked to have the chance to meet you sometime, which, in my time… in times gone by, without internet, was almost impossible; not more now, thank God. Now I’ve discovered that the saga it’s available on DVD and I’ve decided to take it, (although I didn’t understand all the words, it’s been great to listen it with your real voice, without dubbing,). Coming back from England I’ve googled to know news from you, what you are doing nowadays and so I’ve found out that you wrote a book of memories called Making Poldark and that you are about finishing to write an update of that book, I also found your lovely blog, born, I suppose, for your equally lovely passion for cooking. I love to cook too and, being Roman, I like Mediterranean diet and as I have a big family (husband, one son and two daughters and grandparents living with us) I have to cook a lot so I’m always in search of good, healthy recipes. You’ve made a great work and I think that such a book is a blessing especially for those who have to bear the burden of diabetes. I congratulate you on the choice you did to live in a rural area, I suppose that after being a star of cinema and theatre it isn’t easy not to let that your success go to your head and remain like a “common” person. Again on internet I saw that you’re going to sign the copies of your first (the first of a series I wish!) recipe book on 17th September in Truro and you can’t imagine how much I would like to be there! But sadly Rome is not so near . And now I know that I could sound like a groupie and I’m just blushing with shame, but could I ask you an enormous favour, please? Could I ask you to sign (a dedication will be very much appreciated) a copy of your recipe book, a copy of Making Poldark for me and send me them to Rome? I could send you payment electronically in advance. In case you can’t, can you just let me know it, because a friend of mine who lives in Altrincham Cheshire at the moment, is coming to study in Rome from the 25th September, so I can ask him to buy for me a copy of them in England, because in Rome I haven’t fund them. At last, hoping I haven’t bored you, I really wish to thank you sooooo much for all the magic moments, the intense emotions and the wonderful daydreams Ross-Robin gave us as a present. With my hearty wish for you and your wife of a tranquil life, happiness and good health and with all my love from the Eternal City. God bless you! Hello Maria–mille grazie for your generous comments. We were blessed with great stories and characters created for us by Winston–so lucky. It is so great that they continue to touch people’s hearts. We are editing Making Poldark at the moment. I will let you know when it’s available. Thank you so much … and sorry, I’m ashamed to ask you again: what about to have a signed copy of your recipe book sent by you / your staff to Rome? Would it be possible? How can I get in touch with your staff to send them my payment? Just google Waterstone’s in Cornwall for their email address. I’ll do it, hoping it will work well! We’ll sort something for you Maria–never fear. rob for the first time in far too long i have just taken a look at your blog and am moved and amazed at what you have been up to. it inspires, nourishes and fascinates really great stuff .i don’t need to say keep it up, i know you will, you have found your voice. So happy to find your website, Robin. I’ve been a fan for ages; swooned over Poldark on Masterpiece Theatre, Sunday nights. Heaven! Then I was practically barking mad waiting for the next season when one would finish. Nothing so romantic as you finding Demelza after she ran away. Ah, the memories. But time marches on, doesn’t it? Now I’m a Type II diabetic as well. I’m having to learn how to cook a new way. Also, my husband of a lifetime now has terminal cancer and nutrition is extremely important to his comfort and wellbeing. So I’m trying to re-do the way I do. However, your book isn’t available here yet, so I anxiously await it. God’s blessings to you and your wife, and your happy life. Hi Alison–I have a teaspoon of cinammon on my breakfast every morning! The simple fact is that you can enjoy a tasty way of eating in spite of the condition. I am a new reader/fan of your blog. My name is Robin Ellis, too! I am a girl however (Robin Anne Ellis). I love to cook and adore France (I work in Geneva, Switzerland every summer as I am event planner & upon finishing visit France). Welcome and we even share initials, Robin! My second name is Anthony. I would like to ask you how can I buy your book of recipes? I ask you it because I’m italian and I know that your book isn’t been published in Italy. I would like to ask you how can I Have a copy of your book of recipes? I ask you it because I know that your book hasn’t been published in Italy yet. I just checked on Amazon Italy and it is available, Gaetana. Gosh, first I am introduced to “Poldark” via a Netflix.com recommendation….and WOW is all I can say. What a terrific series — (although Netflix is not streaming Series 2 at the moment. Don’t get me started.) and then come to find out you’re a cook and here I am just getting over my intimidation of cooking! I live with a tiny kitchen here in New York City, (where a normal kitchen is left for kings), but I will not let that stop me anymore. I came to this realization – if I am impeccable with the entertainment I choose to watch, impeccable with the friends I keep company with, impeccable with my work and my word, then why not food as well? Why choose to settle there? I look so forward to buying your book and giving it a go and I am not diabetic, btw. I just want to eat as fresh and simply as possible. It is doable. The stuff is out there, you just have to learn how to put it all together. And you are so right, it may sound like nonsense to cook a meal for an hour for one person and that takes ten minutes to eat, but why not? That hour is so worth your time and health…. I come from the entertainment biz, worked in theater and also managed stand-up comics and TV writers and we lost a great comic at the age of 41 in Nov 2011. Patrice Oneal, http://www.nytimes.com/2011/11/30/arts/patrice-oneal-boisterous-comedian-dies-at-41.html…who also battled diabetes, and just refused to be proactive about it. So much so he even joked about it. I wish I had known about you and your book sooner because I would have told him about it. I had two separate black and white darlings, who saved me from sheer insanity each time. They are angels, they are. Thanks, Stephanie–go black and whites!! Sad to hear about your friend who died so early. It is difficult because the early signs are so hard to spot and therefore difficult to feel any urgency about. I can’t believe I discovered you after all these years! I followed Poldark from start to finish. As a teenager,I couldn’t wait until Sunday evenings and the Masterpiece Theater theme music. Alistair Cooke appeared and I was in for a real treat! I loved the story,scenery and suspense.Poldark will always be a wonderful memory for me. And now,to follow your adventures in France and the world,what a rare present! Thank you so much for opening your home and life to all of us.Your generosity and friendship are gifts to be grateful for.I appreciate your humor and thoughtfulness. I’d like to think of what would have happened to the characters from Poldark after the book series ended.Ross and Demelza might have settled into domestic simplicity.Alas,we will never know! It is comforting to know that at least the man who will always be Ross Poldark MP in our eyes is settled happily with his wife and two/four legged family! My husband is a type II, and I am delighted with the recipes on your blog. Thank-you for sharing them. Is there any possibility that your cookbook will be available as an e-book? I was thinking it would be very helpful to have the book on the iPad because then I could take it to the market or even on vacation. I’m glad you are finding the book useful, Belinda. We are hoping that it will be available as an e-book soon. We are talking to the publisher about this. Don’t hold your breath but watch this space! I happened upon your website yesterday by sheer chance when I was wondering about Anharad Rees, who played in a couple of episodes of Remington Steele. I was terribly saddened to learn she had died just recently. However, when I Googled Poldark I discovered that you are alive and well and living in the South of France, cooking and conquering Type 2 diabetes. I too watched and loved all of Poldark when I lived in NYC and now have just had to switch to a diet to inhibit incipient diabetes. I live now in Santa Fe, NM, Like you, I love to cook, but find that many of my favorite recipes (mostly from Julia Child) are off limits. I’ve invented a few “Mediterranean style” that work but also use quite a few from Marcella Hazan that are perfect. However, I’ve just ordered your cook book and am looking forward to expanding my repertoire through your tested combinations. Bon apetit, Nancy and welcome. Marcella is a hero of mine and she inspired something I cooked for lunch today! Wow, I didn’t know Poldark could cook… 😉 Seriously, I watched the first Poldark and loved it. Yesterday my husband and I were watching the episode of the new series, when Judge Halse sits to play with Poldark. Suddenly I looked at the judge’s profile, clicked the hold button and yelled: IT IS POLDARK!!!! Almost gave my husband a heart attack, lol. It was wonderful to see you acting in the series. I can’t wait to check the cooking books. God bless and keep the good recipes coming. Welcome Emilia!–no more sudden shouts–please!! Happy Birthday, Robin! May you have a wonderful day and many birthdays to follow. And thank you for the countless hours of enjoyment you have given me through all the different shows and movies I have watched you in, especially Poldark. I salute you, Cap’n! I love your acting, but I am here to ask if I could use the little man walking in my seminars…obviously I will put your great website in my meetup and presentation for Mindfulness. I ask people to walk around the room and it will be great if I could have the little man walking. Sure–though I’m not sure I understand ! I attended your excellent cooking event at Larchmont Village last month. Could you please advise me of a good way to contact you in relation to a media enquiry.. It was fabulous seeing you at Larchmont Village last month. I wanted ask who I should contact regarding a media request. I am media request or enquiry. Hi…. I was so disappointed to miss you in Weedon on Sunday. Half way there my brakes decided to seize, and I ended up at the garage. I had hoped to buy another book, which Booksmiths have sorted, but also…..please don’t laugh…..I had with me a photo of you on your bike. It was published in a newspaper and I wrote to them for a copy. It has been framed and on my wall for around 40 years. I did have a place setting from PAS dinner at Clive Hotel that you kindly signed, inside the frame. Unfortunately the ink has faded away. I wanted to ask you to sign the photo for me. I recently bought your cookery books as I was trying to learn to cook and eat more healthily after years of shift work in the emergency services and then cancer four years ago. Today it would seem that I am glucose intolerant so am going to have completely overhaul my diet as it’s been a bit of a wake up call at age of 38 . Just wanted to say really enjoying your books and slowly starting to incorporate your recipes into my repertoire. Going to read your autobiography soon as well that’s next on my reading list. Good to hear from you, Dave and congratulations for realizing it was a wake-up call. I hope the books continue to encourage you to cook–it is the best way to be in control of what you eat.